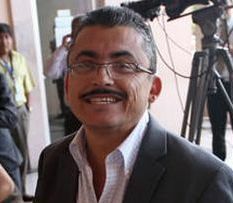 The Minister of Security, Pompeyo Bonilla, has confirmed this evening, that the lifeless body of Radio HRN journalist Ángel Alfredo Villatoro Rivera was found abandoned along the side of the road in an isolated and dimly lit region of Las Uvas, in the southern region of Tegucigalpa. Mr. Villatoro Rivera was abducted on the morning of Wednesday, May 9th, on his way to work at Radio HRN. President Lobo on May 10th, publicly asked the captors to release the reporter unharmed. Mr. Villatoro Rivera’s identity was confirmed through fingerprint matching. His body was found blindfolded with a red cloth and dressed in a very old uniform used by the National Police Cobra squadron. Preliminary reports indicate Villatoro Rivera suffered four gunshot wounds. Ángel Alfredo Villatoro Rivera’s body has been taken to undergo forensics, and the situation is being further analyzed.